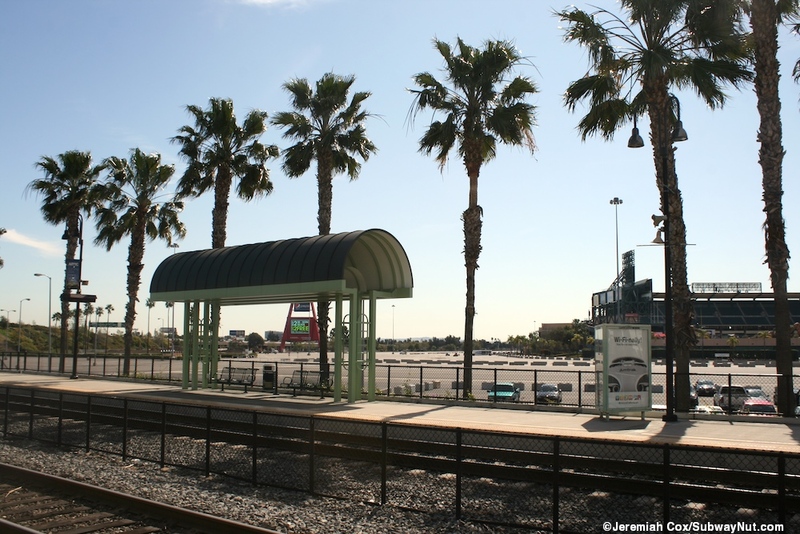 Amtrak's San Diegan trains started stopping in Anaheim (then 7 daily round-trips) on October 30, 1983 (Jack Boetter, "New Passenger Depot Will Put Anaheim Train Service Back on Track," Los Angeles Times, Oct 12, 1983, Link), at almost the same location as today along the north side of the north parking lot of the Big-A, Anaheim Stadium which opened in 1966, renovated before the 1998 baseball season (after the Rams football team left) was renamed Edison International Field and in 2004 received its current name Angel Stadium. 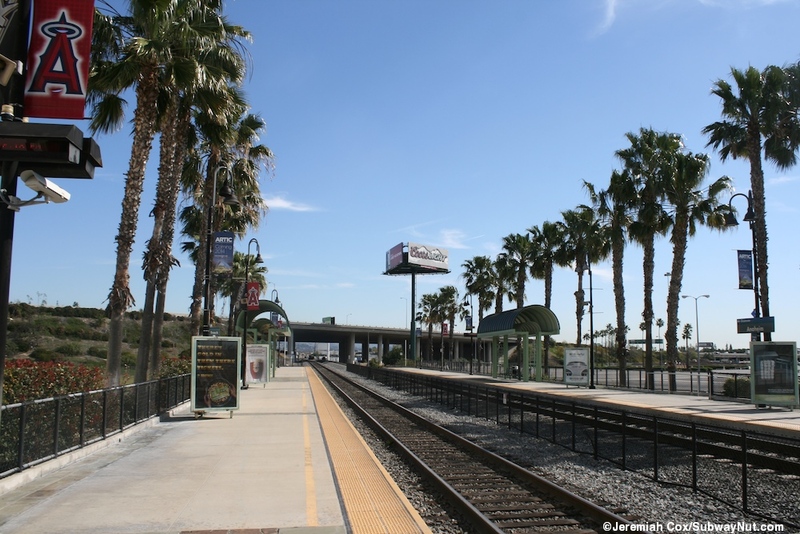 In 1984 a former ATSF depot was used for passengers that was plagued by a leaky roof and today's 'modern' AmStation, the only one in California which looks similar to those in many Eastern Cities (Buffalo-Depew, Rochester, Dearborn, ect.) 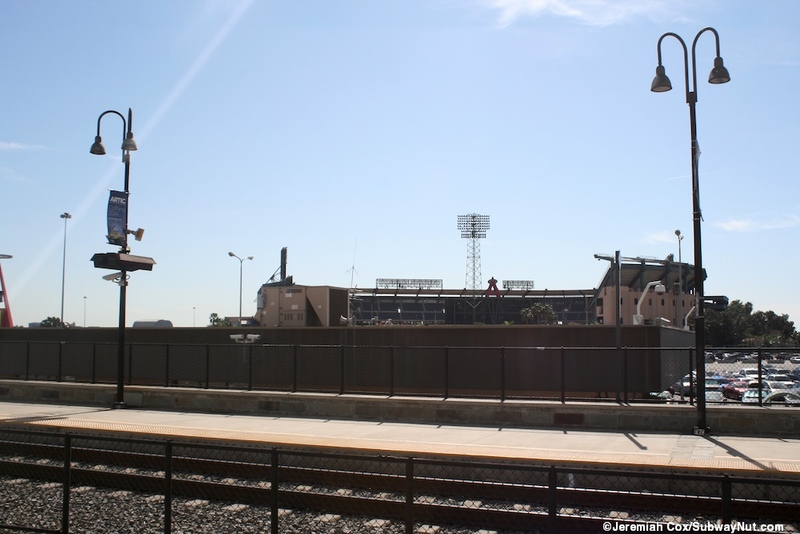 opened in 1986. 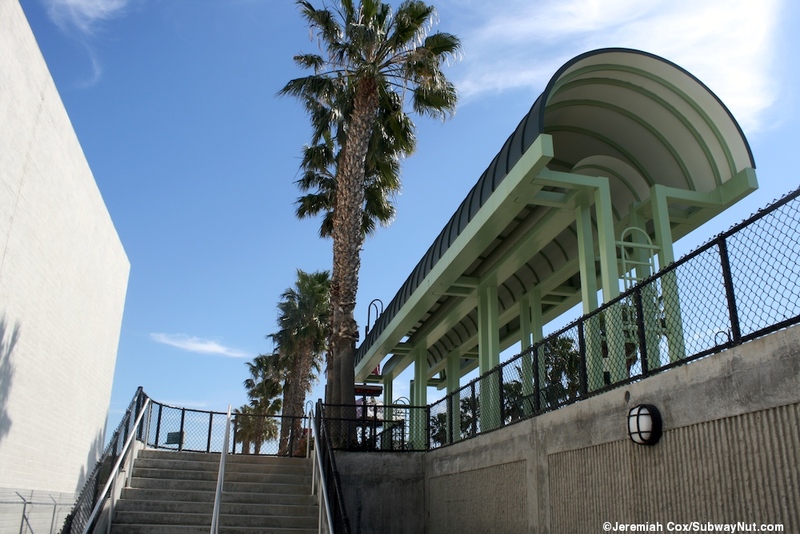 The AmStation design here has been adopted for the warmer Southern California climate, the walls are not made of bricks but a more solid material (stucco?) 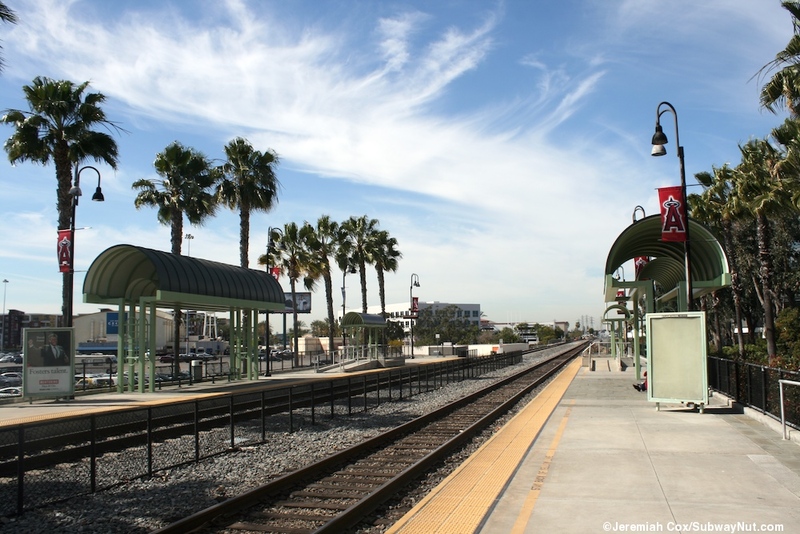 and painted a brown pinkish color. 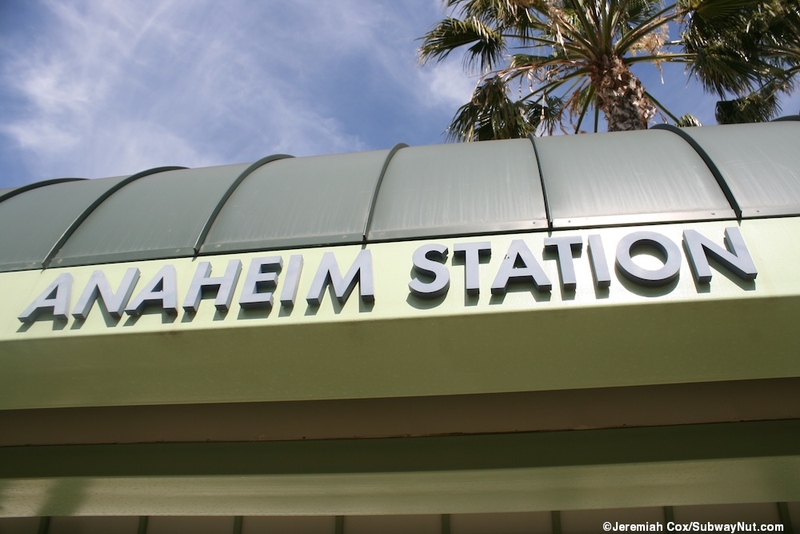 It still has the overhanging brown roof that covers both an indoor waiting area with a ticket office with baggage check-in and a little alcove with Restrooms and Vending Machines. 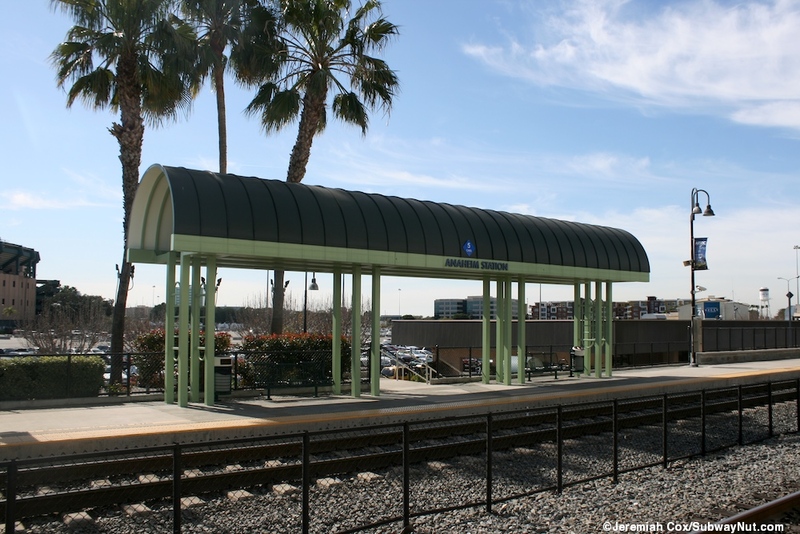 The same roof covers an outdoor waiting area which is nearly the same size, held up by pillars just like the indoor portion. 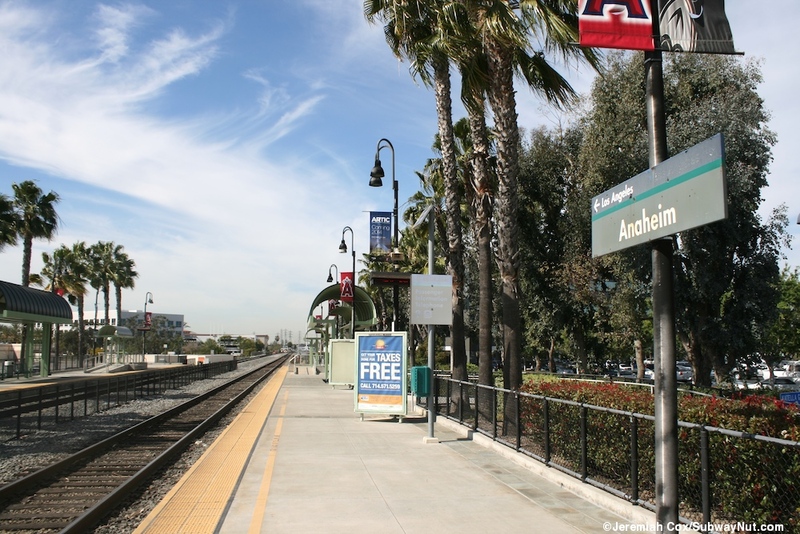 Inside are a few wooden benches and Metrolink TVMs. 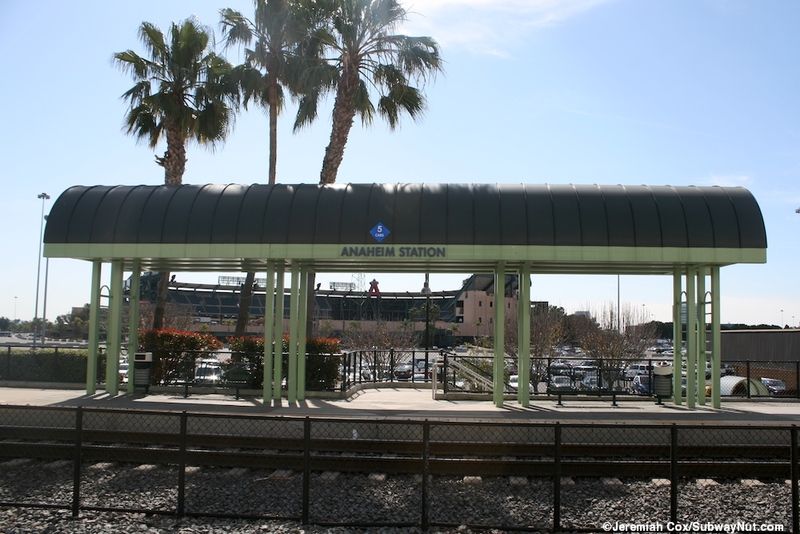 Outside of the station and now covered by some greenery (there is greenery surrounding both of the platforms) is a brown Amtrak pointless arrow logo. 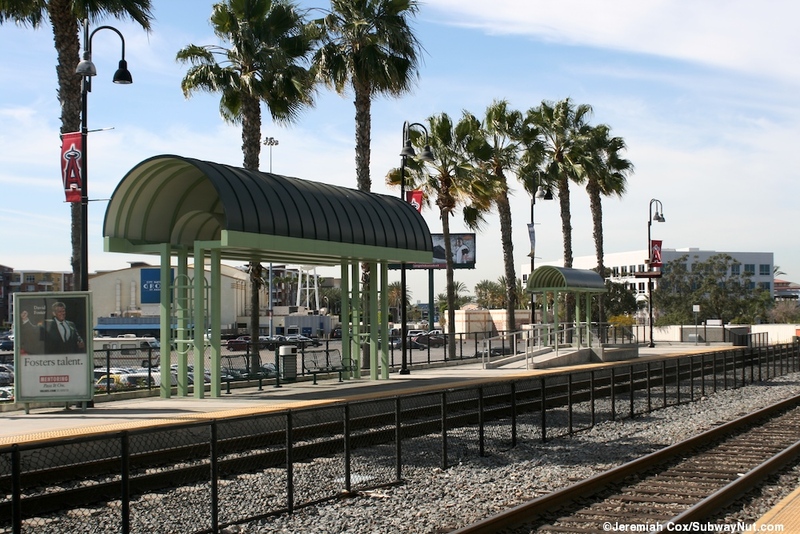 The station presently hosts all eleven daily Pacific Surfliner Trains and is the only stop exclusively served by only Metrolink's Orange County Line with ten weekday and two weekend round-trips to and from Los Angeles plus the 3 evening weekday OCTA sponsored round-trips just north to Fullerton. 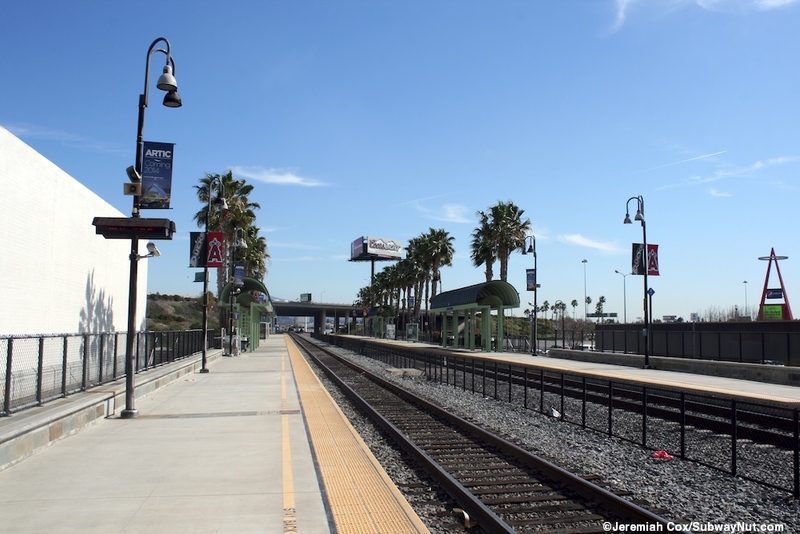 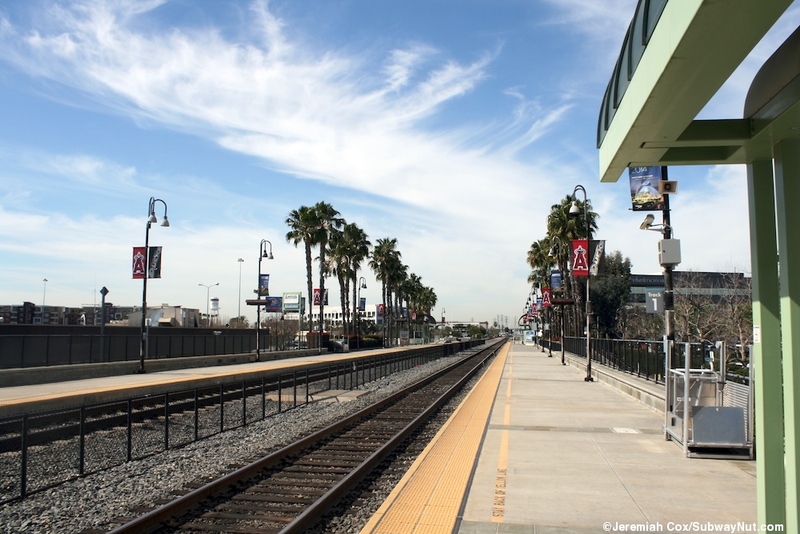 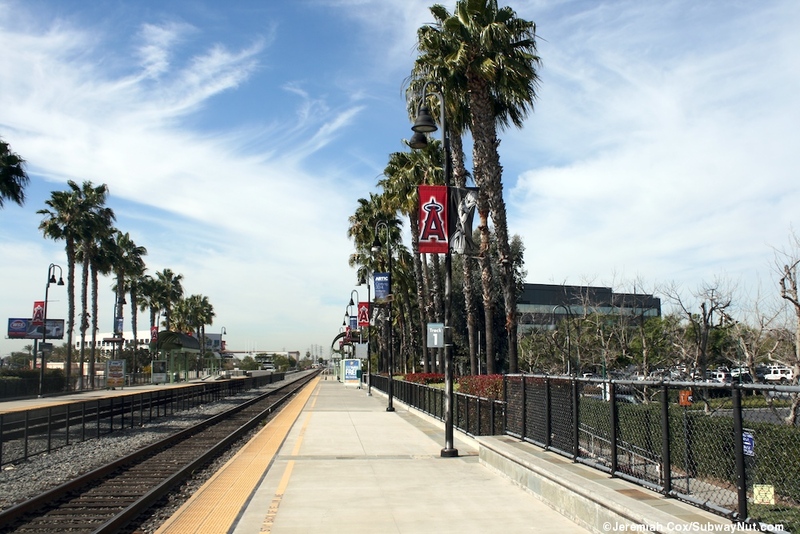 For the 2012 baseball season there are special Metrolink trains and $7 fares to and from all weeknight Angle ball games north to Los Angeles and south to Laguna Niguel/Mission Viejo. 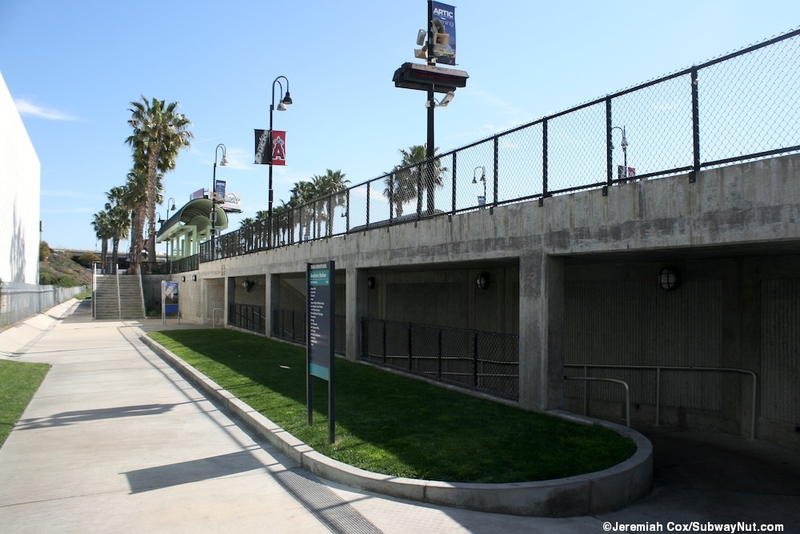 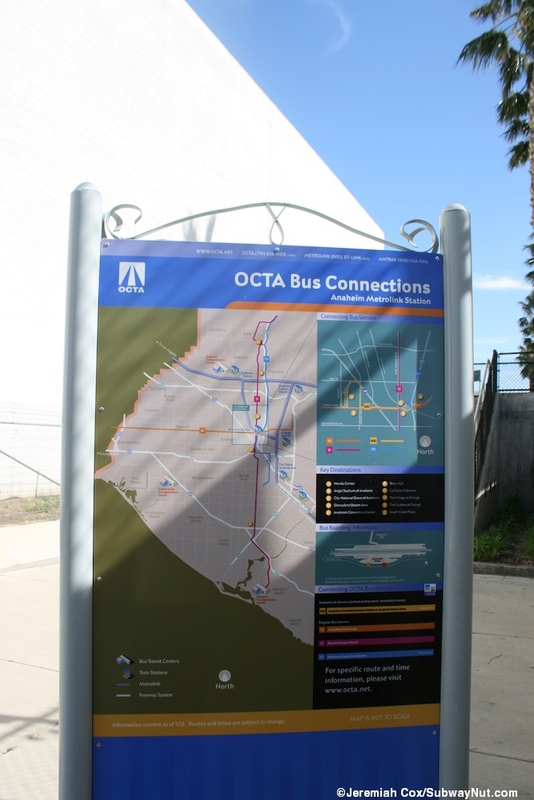 The AmStation is on the northern side of the Angeles Stadium's Parking lots and Metrolink's website claims 400 spaces are available to commuters in these parking lots. 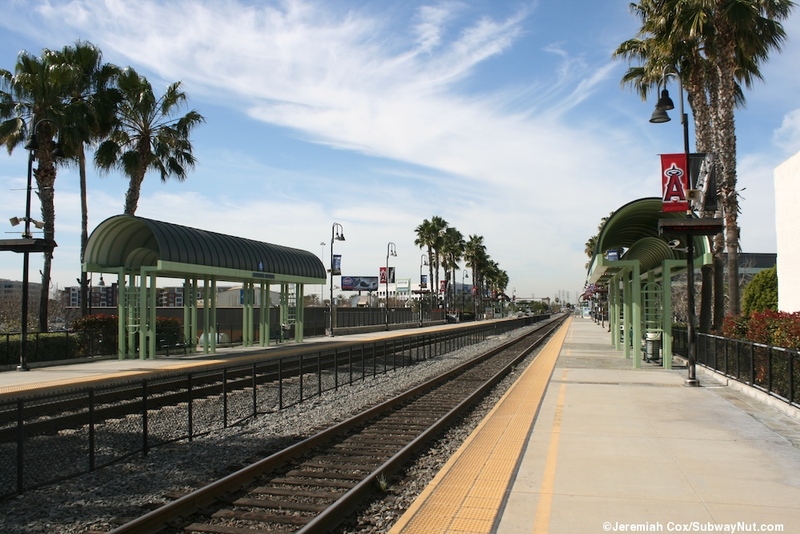 The station is slightly beneath the train tracks which have two side platforms serving the two track line (with a fence between the tracks). 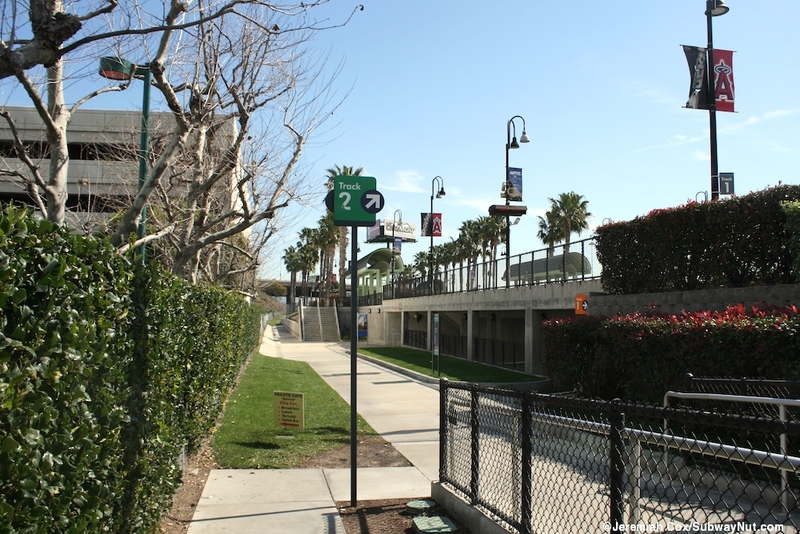 The two platforms are connected by a modern concrete underpass with staircase and ramp entrances down to it as well as up to each of the slightly raised platforms. 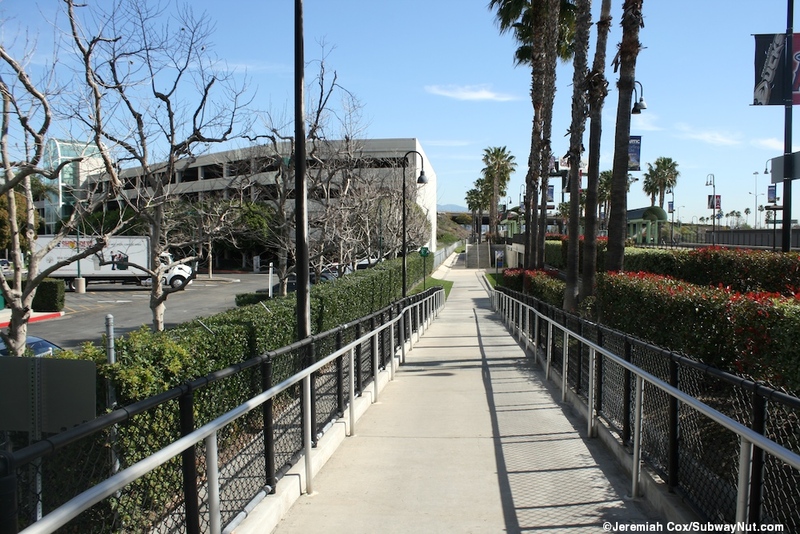 The northern end of the underpass leads to that platform for track 1 and the Katella Gate, open daily 4am to Midnight which leads to some suburban office buildings north of the station and a pedestrian walkway through it to Katella Avenue. 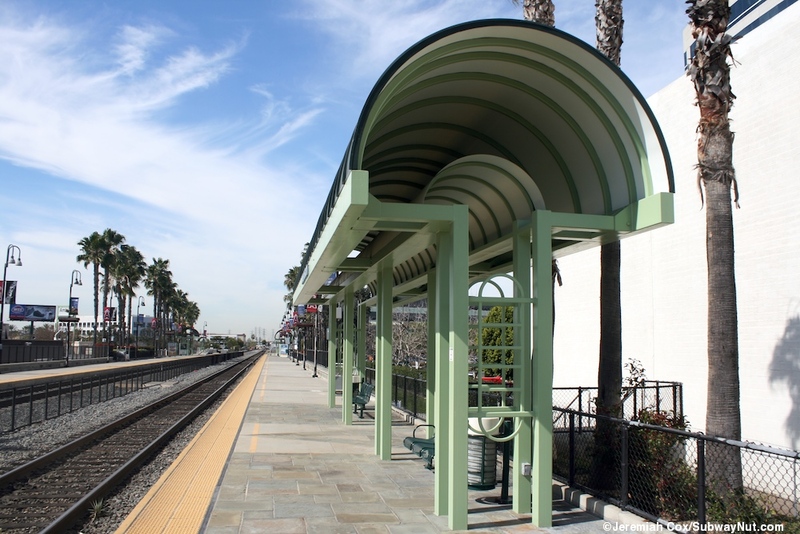 The two platform's other amenities are three green shelter structures (one on each is double width) covering benches. 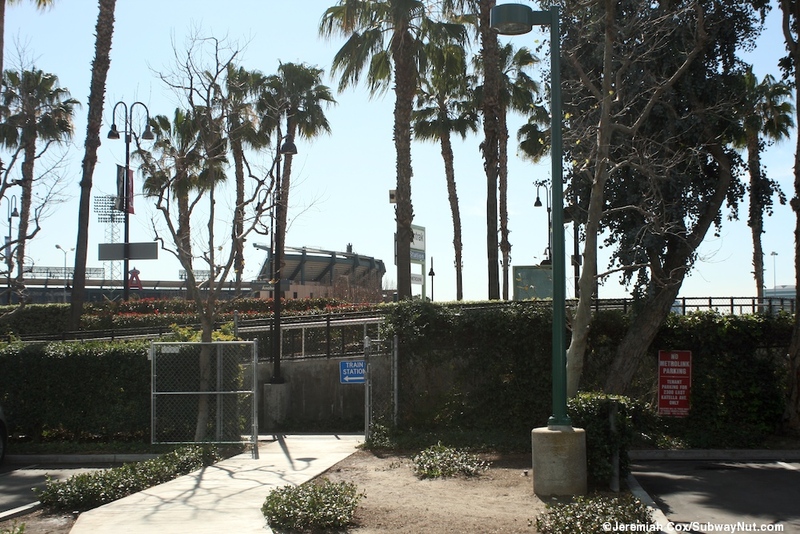 There are also lampposts that have banners hanging from them for the California Angles of Anaheim and the Anaheim Ducks (formerly Mighty Ducks of Anaheim) NHL team which play in the Honda Center, a block away from the station.